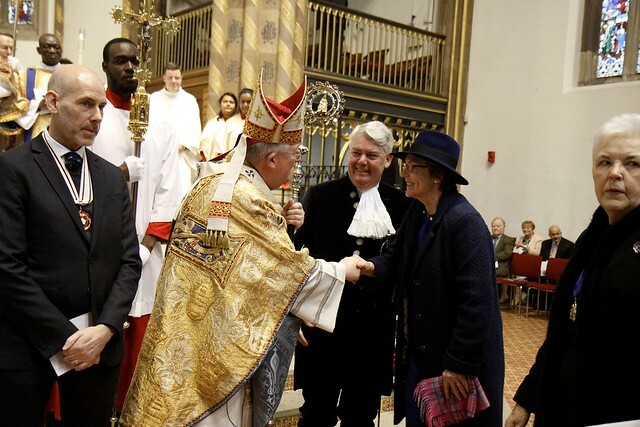 On Sunday 25th November, on the Feast of Christ the King, His Grace The Most Rev Bernard Longley welcomed all to St Chad’s Metropolitan Cathedral to celebrate the annual Civic Mass. This is an important event in the calendar of the Cathedral as we join with representatives of the Lord Mayor, the judiciary, service chiefs, council leaders, with representatives from other faith groups and those from diocesan organisations as well as regular worshippers. This year’s Civic Mass on the Feast of Christ the King was our Cathedral’s principal commemoration of the centenary of the First World War. The date also marked National Youth Sunday, whereby young people across the Archdiocese were invited to be at the heart of the Mass celebration. In his homily, His Grace, Archbishop Bernard Longley talked of Remembrance and the memories passed down through families, continuing to be an important element of our identity as individuals, families and communities and as a nation. He said: “Many families across our city have similar memories – memories that secure the ties between our different ethnic, cultural and faith communities. “Prayers for peace have been offered in their hundreds of thousands in our different faith traditions.